Journalists Cem Küçük and Fuat Uğur, staunch supporters of Turkish President Recep Tayyip Erdoğan, called on the government to seize all assets of people linked to the Gülen movement to pay off a fine the US Treasury is expected to impose on Turkish state lender Halkbank for evading Iran sanctions. “If the US and the US judiciary fine Halkbank, the Turkish justice system and other institutions should seize all the assets of Fetö [a derogatory term used by the government for the Gülen movement] members. I am not talking about the assets that have already confiscated. 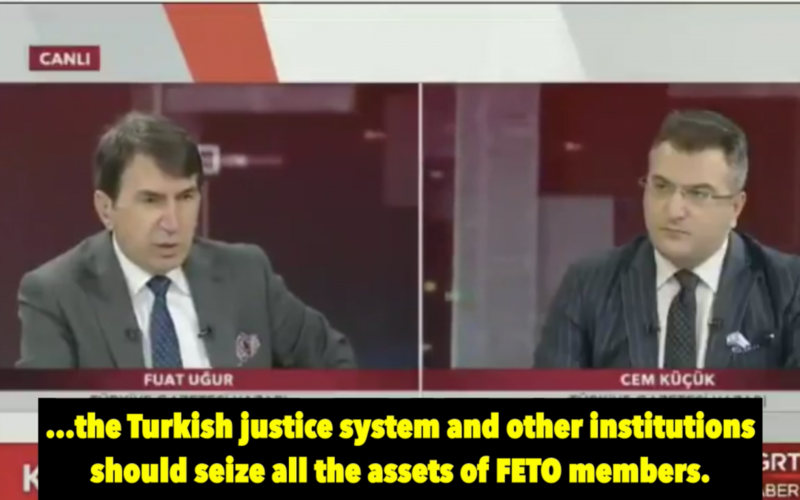 All assets of other Fetö members should be seized. If the fine is paid, it should be paid by selling their assets,” Uğur said during a Thursday program on TGRT. “Also from their salaries. You can cut a certain amount. If he is a teacher or doctor, let’s say, seize the salary. You can leave something for them to survive on,” Küçük said during the program. Amid an ongoing witch-hunt targeting the Gülen movement following a failed coup attempt on July 15, 2016, Turkish Interior Minister Süleyman Soylu on Nov. 16 said eight holdings and 1,020 companies had been seized as part of operations against the movement. Turkish Deputy Prime Minister Numan Kurtulmuş said on July 18, 2017 that the government had seized 4,888 properties belonging to 966 companies from people allegedly linked to the Gülen movement. The total value of seized properties is estimated to be over $11 billion. The jury in the trial of Mehmet Hakan Atilla, an executive of Turkey’s Halkbank charged with participating in a scheme to evade US sanctions on Iran, in US federal court on Wednesday reached a verdict of guilty on five counts, including bank fraud and conspiracy, and not guilty on one count of money laundering. Zarrab said that Turkey’s then-prime minister and current president, Recep Tayyip Erdoğan, personally authorized the involvement of Turkish banks in the scheme. This article originally appeared in Turkish Minute on Jan 4.